These pillowy clouds of cheesy heaven are the perfect party snack and will leave your guests begging for more. 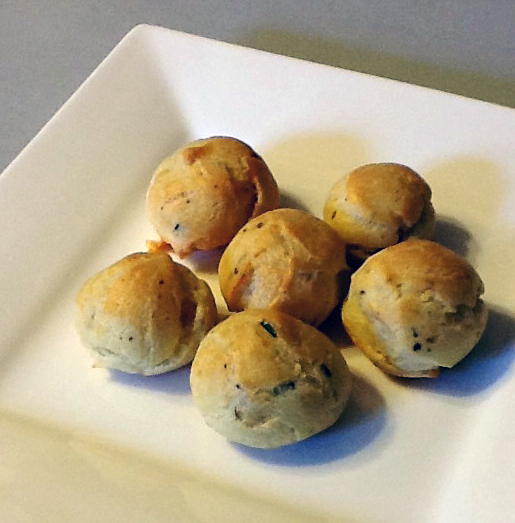 The puffs are super easy to make and can even be prepped ahead of time and baked off just as your guests are arriving! I used Blue D’Auvergne but you can use a gorgonzola, Maytag blue, or any semi-firm blue cheese you like. 1. Preheat your oven to 425F. In a small saucepan bring the water, butter, salt, & pepper to a boil over medium-high heat. Quickly add the flour and stir until it forms a ball that pulls away from the sides of the pan. Remove the pan from the heat and dump the flour mixture into the bowl of a mixer fitted with the paddle attachment. Let cool for a few minutes. 2. On low speed, incorporate the eggs one at time. Once the batter has smoothed out add in the blue cheese and chives and mix for a few more seconds until the pieces of cheese are broken up into the dough. 3. Spoon the dough into a pastry bag fitted with a wide, round tip (or use a plastic bag with the corner cut off to create about a half-inch opening). Cover a baking sheet with a piece of parchment paper and pipe out the dough into small mounds, about the size of quarter, leaving about a half-inch space between each puff. Dip you finger into some warm water and gently press down on the peak of each puff to shape it into a round.